The easiest way to determine if you currently have administrator rights on your Windows XP system is to right-click the Start button. A small menu will appear--if the options include Open All Users and Explore All Users then you do have these rights. 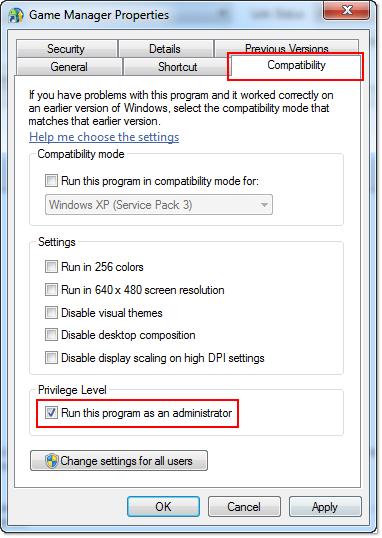 If you're able to save your game progress after following the above steps, please follow the below instructions to make Game Manager always run as administrator. If the above steps don't help, the problem may be due to security software preventing the game from creating save files. Before playing your game, try temporarily disabling any security scans or live scans running on your computer. We recommend that you consult your security program's support information for specific instructions on how to configure any scans that it may be running. If you're using a Mac computer and are unable to save your game progress, follow the instructions below to remove the game's files and reinstall the game. This should allow you to start a new game and be able to save your progress. If you have not yet purchased the game, go to the Find a Mac Game page and reinstall the trial version (when available) to play any remaining minutes.